This year, I’m doing a weekly post about food because I want to eat better. I like to eat, but that’s the only thing I like to do with regards to food. I don’t like buying it. I don’t like thinking about it. I don’t like preparing it. Improving my relationship with food will be a challenge. My first goal is to start making myself a lunch to take to work, so I bought myself a cute lunch sack. That’s it. See, this is going to be a challenge. This entry was posted on Thursday, January 2nd, 2014 at 9:02 pm	and is filed under What's To Eat. You can follow any responses to this entry through the RSS 2.0 feed. You can leave a response, or trackback from your own site. 38 Responses to " Cute Lunch Sack"
Hahaha! That’s the cutest lunch bag I’ve ever seen! I also hope to eat healthier, but I love junk food way too much. As I eat this delicious slice of carrot cake. Boo. Hope your new lunch bag gets a workout! Tom takes a lunch everyday of lettuce and kale, a celery stick, a carrot, 2 pretty big pieces of red bell pepper and 2 pieces of yellow bell pepper,he takes a slice of red cabbage, a couple of redises. It is a beautiful lunch!!! In the winter he also takes a thrmos of my home made soup. Eating salad stuff is easy to make a lunch out of and so good for you!! I would love to help you with your food thing b/c I use to be the same way. Now I love food and love to fix it too!! Tom does most of the food shpping tho. Very cute! I think that if I could choose some other occupation different than anything I’ve done in the past, I’d be some sort of chef or something. I love cooking and trying new recipes. I’m also very organized with my grocery shopping and what I need to buy for my dinner meals. Food posts will be fun 🙂 I keep getting the urge to start some sort of food blog, but that would just be so much work! I know how you feel, the only thing I like doing with food is drawing it and eating it! Love the bag. That should be good motivation. Have a fabulous Friday. Just think of the money you could save by making your own packed lunch. I love the bag. What a cute bag! When I worked lunch in the winter was challenging because I tried not to have to go out in bad weather. That’s a very cute lunch bag! I have one from thirty one and I do have to say that having a cute bag does help. I don’t know what your plans are to help improve your love of preparing food, but one thing that we love here is cooking in the Crock Pot. It’s really easy, you just put it in before you leave for work in the morning and it’s ready for dinner! I have a lot of favorite recipes for it that really help us get through the cold months of fall and winter. You and I have very similar food attitudes. I do like eating but that’s about it. Fortunately for me, I have a spouse who loves to cook healthily. But, I must admit, when he goes out of town, I eat really badly! I have the opposite problem, I like food, I like thinking about it, I like buying the ingredients and I like making it. It is a cute bag. Maybe taking leftovers for lunch will help. Lunch is a tough meal for me because I get tired of lunch foods. 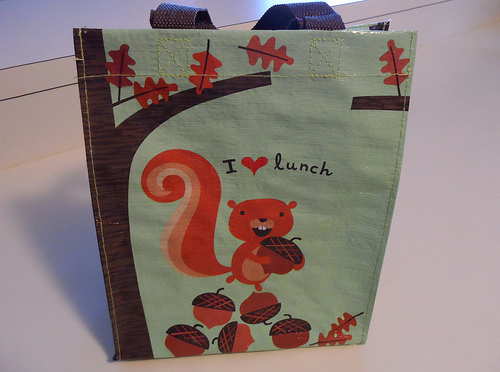 That is a super cute lunch sack! Wish I felt a little more like you do about food. I love EVERYTHING about it. And I think about it all the time! Well, I think about food that is bad for you. I don’t recall ever thinking about a head of lettuce or green beans (not even extra green green beans). I hope you are okay. You haven’t updated your blog in a few days. That is not normal for you. Lori, are you OK?????????????????? I am worried about you dear friend!!! Are your classes over now??? That is perfect for tomorrow! It is National Squirrel Appreciation Day, Jan 21st! Yes this going to be hard but it really doesn’t have to be. You just have to think about it differenely. A fun new challenge. Food is so good and so fun once you get ino it!!! Salad is the best thing to take for lunch. I fix Tom’s lunch 5 days a week. He takes lettuce–he likes red leaf–he takes 3 or 4 leaves of red leaf luttuce and two leaves of kale– dinosaur kale!!! 2 slices of red bell pepper and 2 slices of yellow pepper. A carrot and a piece of celery. Some raw red cabbage.redishes 2 or 3. Cucumber if we have any!!! Fruit if you have some !!! He loves this lunch!!! I am awful with food. I love eating it (though often I hate myself afterwards, or my stomach hates me) but dislike shopping and cooking. Dinner parties reduce me to a nervous wreck. The result is that I eat a lot of garbage! I admire your resolve – keep us in the loop as to how it goes! Lori, What do you think about eating a big salad for lunch???? How are your lunches coming along??? Try to blog about them soon OK????? I would love to know what you are doing about that? It is a gift of a life time for them!!!! Hope you are ok Lori. You’ve gone so quiet. That is a cute bag. I know lots of people derive great pleasure from cooking and preparing amazing dishes; I do not. So much easier to open up a bag of something crunchy and break out the vegan sour cream 🙂 Here’s to finding ways to make time for a better diet! Where have you been? We miss you! Hope all is well with you and the pups. Hey…..we hope you all well and you are just busy with your new job…we’ve been by several times to check for a new post….thought it was time to let you know you are missed. Hope all is ok over there. What are you eating for lunch?? Hows the job coming??? Hows the pups??? How are YOU feeling??? The vet just told us Ruby needs to go on a diet …apparently, she has gained 1.5 pounds since she moved in with us. I think Angel Pip must be sneaking her cheeseburgers when we are not looking. I have very much the same relationship with food. I don’t mind preparing it if it only takes a minute or two, like making a sandwich. But I don’t wanna spend 20+ minutes making an entire meal. That’s just too much! Plus I’m not so good at following directions. If the recipe says, “bring to a boil slowly,” I think I have better things to do with my time and turn up the heat. Or I won’t have a specific ingredient, so I try to replace it with something different that is unlike what the recipe calls for. Good luck to you.